Order your MEE Audio Earboost EB1 Adaptive Audio Enhancement Bluetooth Headphones from AMS and enjoy 0% Interest Payment Plans, Free Shipping, Free Extended Warranty & 45 Day Money Back Guarantee. Designed to adapt to your hearing curve, EarBoost helps you enjoy your listening experience. Working in tandem with MEE Audio's custom app to calibrate your headphones, you will hear every sound to the fullest with great detail and clarity. EarBoost headphones utilize MEE audio’s EarBoost iOS/Android companion app to tailor the sound to each user’s unique hearing curve for an improved music and media experience. Test your ears with the built-in hearing test tool to create a personalized audio profile tailored to your hearing curve. Tweak and refine your profile with our manual adjustment tools. Save your customized audio enhancement profile to your EarBoost headphones and enjoy your enhanced listening experience with all Bluetooth devices. Clear, distortion-free digital sound brings music and other media to life with clear speech and dynamic bass. Qualcomm aptX Low Latency technology improves lip synching with compatible Bluetooth devices. Built-in magnets keep the earpieces in place until you need them. 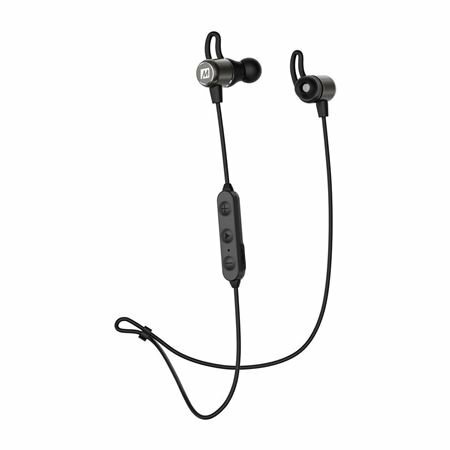 Ergonomic earpiece design, 3 sizes of eartips, and flexible earfins provide a secure fit and all-day comfort.